The transfer window is upon us. This is the time of the year when some of us are excited about who are sides could buy, while there are some of us who dread this time of the year, as it means some of our heroes and idols could be prized away from our beloved clubs. The latter feeling is probably what most of the relegated sides are feeling like. This season, there are some brilliant players who face the raw reality of playing in the Championship. And with this, it means clubs in the higher divisions are sniffing about these relegated sides to find themselves a bargain on good talent. So what I’ve done is made my best XI of the relegated Premier League sides (Wolves, Blackburn and Bolton), with the help of stats. Goalkeeper: Paul Robinson: Picking out of the keepers Bogdan, Robinson and Hennessey was surprisingly hard. At times all three have been dour, while at other times they have kept their teams in games. I chose Paul Robinson as the former England international hasn’t been that bad this season. You could easily argue he’s been Blackburn’s best defensive player this season. But what makes Robinson stand out ahead of the other two relegated keepers, is the fact he’s made a good amount of saves but most importantly he’s made the fewest mistakes too. Robinson offers more than just good goalkeeping, the former Spurs man is a good leader and is very experienced. Right Back: Jason Lowe: This was yet another tough choice, simply because I feel none of the right backs for the trio of clubs have been that great at all. I’ve gone with Blackburn’s Jason Lowe, for two simple reasons. Reason number 1 is the lad is 20 years old and point 2 is the kid has shown glimpses of potential during this season. However, on the same token, I feel Lowe has quite a bit of improving and developing to do. I feel he could win more ground duals and tackles. But with experience and confidence in his technical ability this will naturally improve. What excites me about Lowe is that at 20 he’s near enough at the level of right backs who are at their supposed peak years. Lowe has also created 15 chances which demonstrates his willingness to go forward. It also shows the creativity and intelligence in his play. At 20, Lowe’s stats show he is a competent Premier League right back. Blackburn may struggle to keep hold of this talented young lad. Rodger Johnson: I think Johnson has been a decent signing for Wolves. However, he hasn’t covered himself with much glory during certain parts of the season. However, when focused he is a Premier League standard defender, although in the past two years, he’s been relegated with two different clubs. So he’s hardly a great omen to have knocking about. But I feel Johnson is a well rounded defender who can not only tackle, he challenge sufficiently in the air and he reads the game relatively well too. Grant Hanley: I’ve picked another young Blackburn kid for the defence. At 20 years of age, Hanley has shown good promise for the future. The Scottish youngster has won a relatively impressive 76% of his tackles this season. Hanley also reads the game very well for a young lad too. This season Hanley has averaged 1.9 interceptions per game. But there is room for improvement in the kid. I feel he could be a bit more aerially dominant especially as he’s 6 ft 2 inches. Left Back: Martin Olsson: This was one of the easiest choices. The Swedish international has been a solid customer for Blackburn this term. Olsson has shown he is more than competent enough to venture forward and create chances. He has shown solidity defensively too. Olsson won 74% of his tackles and 60% of his aerial duals too. Which isn’t bad at all. At 24 and his ability to play as a left midfielder, I can see quite a few clubs sniffing about him. Defensive Midfield: Karl Henry: This was quite hard. 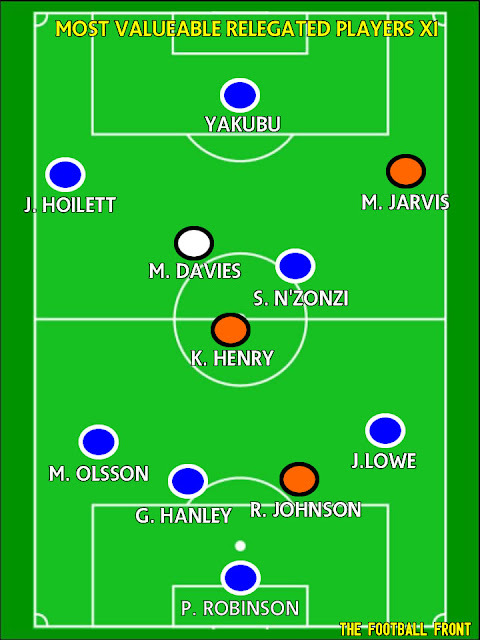 None of the relegated sides had many good holding players. The two who I thought were the best out of the limited options were Wolves’ Karl Henry and Nigel Reo-Coker (who is a free now). I’ve gone with Henry as I think he’s a safer bet at defensive midfield. His tackle record is good and no Wolves player has won more tackles than him. Being a good passer in defensive midfield is crucial too. Henry’s passing abilities are very good, he had a 86% pass accuracy, which for a relegated side isn’t always a common thing. Centre Midfield: Steven N’Zonzi: The Blackburn midfielder hasn’t been outstanding by any means this season. But he certainly is a Premier League standard player. At 23, he’s become a key part of Blackburn’s setup and this is demonstrated by the fact he’s made the most passes for the Rovers this season (1736). But what’s just as impressive is that he had a pass accuracy percentage of 84% which shows he is a player who is very comfortable on the ball and distributing it. N’Zonzi’s distribution and creativity has been fantastic too. The Blackburn man has assisted 5 times this term. Defensively, N’Zonzi has strengths too. He has won 89 aerial duals this season, no player for any of the relegated sides have won more aerial duals than him. Centre Midfield: Mark Davies: Bolton really missed this guy when he was out injured at the start of the season. But when he returned, it’s no surprise Bolton’s fortunes began to change. Mark Davies is an intelligent footballer, one who can pass the ball very tidly. In fact, Davies had a pass accuracy of 87% which is brilliant. Not only this he made 332 final third passes with a pass accuracy of 80%, an impressive feat for a relegated player. I certainly feel Davies will be a good signing for most Premier League sides, especially those who like to keep the ball on the ground. He is one of those players who can command the ball and can his side ticking over. At 24 years old, I hope he stays in the Premier League. Right Midfield: Matt Jarvis: I’ve gone for Matt Jarvis, although he predominantly plays on the left, I still feel he has to be in this team. At 26, Jarvis is reaching is peak and this season he has proved he certainly has the ability to stick around in the Premier League. Jarvis to me is a traditional winger, he can run at defenders and put in great balls into the box. This term Jarvis managed 8 goals and 4 assists, which is encouraging. I feel this lad could be the most expensive relegated player to move this summer. His creativity, work rate and good finishing make him a very useful player. Left Midfield: Junior Hoilett: This boy is special and he’s made that bit extra special by the fact he is a free agent. Hoilett 21, is interesting all the big boys this summer. The Blackburn wizard has shown great promise this term, by often by popping up and getting crucial goals for his side. But what impresses me most about Hoilett is his dynamism and technical abilities. Hoilett has the ability to change games within a second, if you look at his successful dribbles he dominates. The young Canadian has great feet, great dribbling skills and a great touch. He certainly will be a brilliant free transfer signing for someone this summer. But I’ve got one issue with Hoilett. Comparing his chances created to the others, I feel he could create more and during some games he does go missing. If Hoilett wants to become a real top, top player he must get more involved in every game he plays in. 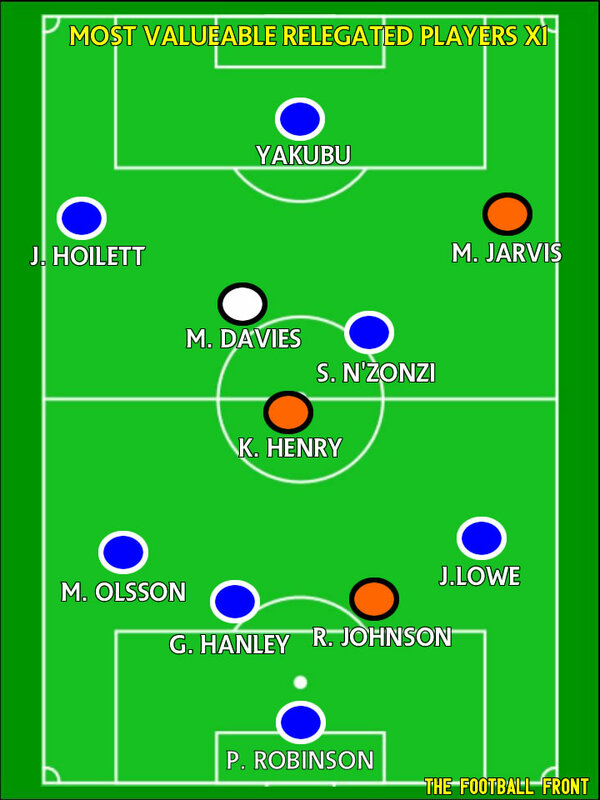 Striker: Yakubu: Like the wingers, picking the striker was hard and it was made even harder by the fact I went with a 4-3-3 system here. I chose Yakubu for a relatively straight forward reason. His goal scoring record this term has been outstanding. To score 17 goals for a side that have been relegated is nothing short of amazing. The Nigerian’s experience, along with his goal scoring prowess will make him of strong interest to a number of clubs. However, a stumbling block could be the price Blackburn put on him. You’d expect Blackburn to want quite a bit for a guy who has just come off the back of scoring 17 Premier League goals. But at 29, clubs may baulk at a high valuation of him. Subs: Wayne Hennessey, Richard Stearman, Stuart Holden, Morten Gamst-Pedersen, Martin Petrov, Steven Fletcher, Ivan Klasnic.